I need to know how to weather. What to use to weather, what steps, what things, and tips and advice. I really don't know anything on weathering, so any help will be needed. It will turn up a lot of stuff but you will have to look through things to find what you are looking for. I think if you spend time looking at things like brick walls, rusty boxcars, etc. you'll get an idea of what the end result should look like. Being observant is not easy, we usually only take a casual look at things, but if we stand back and spend a few seconds studying something, we start to see things we've missed before. An example, next time you look at a fed ex truck, look for the arrow. Its been there all the time but we don't see it. If you can't find it, I'll tell you where it is. Another example, we go to the beach and we see sand, but a closer look reveals seagulls, shells, saw grass, ripples in the sand, rocks, pebbles, etc. Over time, main side bolts rust, and rain cause rust streaks down the side. Dirt does gather a lot on the tops of railroading equipment. Exhaust stacks gather smoke stains from usage. I also took note of which train companies have cleaner cars, locomotives, and equipment. Also, which years in history had cleaner rail transportation. I well, I just need to know what are acrylics? Josh, Testors dull coat maybe what your looking for. After your car is weathered, spray this on to seal in the weathering. Also, GOOD JOB on taking notes and being observant. Acrylics are types of paints, water based for easy clean up. Polly scale paints have all the colors you need like dirt, rust, cement, etc. You can find some here. Truck's and Couplers. Use acrylic's from a tube. Take a smallish brush, and dip just the tip into "Burnt Umber." Try to get as little paint on it as you can. Brush the brush on some newspaper to see if too much or too little is on the brush. The newspaper should be legible, but covered in a little brown. Take a truck be it a locomotive, or freight car, and "paint" it. Not much paint should end up on the truck, but enough to give it a brown black look. Do the same on the couplers, but stay away from the springs and moving parts. You don't want painted shut couplers. Take a bottle of rubbing alcohol or even a cup of water and add 10 drops of Polly Scale or Modelflex "Engine Black." Shake this up well. take a paintbrush and liberally apply this to a car side. Let set a minute, then wipe the car with a paper towel from the top to the bottom. The wash should settle on the rivets. Do the same with the roof, adding coats as you feel necessary. You may also wish to use a brown wash. I'm not a big fan of washes, but they do dull down the bright paint. To make rust spots take a small paint brush and dip the tip into "Burnt Umber" Oil Paint. Dab it on in a few places on the car side. Don't brush it, you only want a small bit. Take a toothpick, dip it in Lacquer Thinner, and use it to add a dot onto each brown spot. The lacquer thinner will cause the oil paint to run down. After applying the lacquer thinner, you should position the car right side up, and let dry. To make the rust scrapes from the doors, if your car has a moving door, simply add "Burnt Umber," or "Burnt Sienna" acrylics to different spots on the rear of the door and open and close it several times. If it seems to heavy you can wipe it up with a paper towel. For Chalks, I use AIM Products, "Medium Gray," and an assortment of Blacks, and Rusts. Take a paint brush, dip it in a darker rust color, and brush it on the truck side frames. Then follow up by brushing black on. You might want to dust the entire underframe with a dark rust. Take a lighter rust, and brush it on the ladders, and roof walk. The locomotives are only 4 months old. 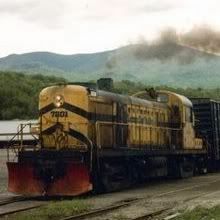 The bottom's of the locomotives are a grayish color, with brown here and there, such as on the plow, below the cab, and on the trucks. Use Acrylics, or Chalks as I talked about earlier, to color the side frames a dark brown color. Do the same on the plow. Mix a Teaspoon of gray, with a teaspoon of brown chalks. Paint this on the lower half of the locomotive, on the pilot, the stairwells, the trucks, the fuel tank, below the cab, or wherever it seems to fit. Then dip the brush in gray, and paint over the brown/gray mix. For the fans and grills take a wash of 1 tsp water, and 1 tsp "Engine Black" Acrylic Paint, and use a small brush to paint this into the grills and fans. you don't need very much, don't flood the areas, just get it into the crevices. This will give them depth, and a slightly weathered look. Earlier I talked about using a very small amount of paint on a small brush to paint the trucks. Use this method, except with black, and even a lesser amount of paint. After the wash in the grills dries, stipple them with the black on the paintbrush. Not much should come off. Then go to the top where the exaust stacks are, and stipple all around those. You can use more paint, making them very black. The black normally extends between 1/8" and 1/2" from the exhaust stack. Finally, Dull-Cote the loco and leave to dry. You should let the paint dry between each of these steps, and don't try to paint over areas that are chalked. Thank you all for your wonderful tips. I've done more looking around on the main line, and thanks for the impressive tips. I've taken notes, copied and pasted them, and printed them out, and saved them in various places, thank you a lot. This may be what I'll need, but anyone else is welcome to add anymore tips, advice, or add anything on to what has been said. Thank you again. Dull coat over chalk - or most other weathering like chalk, will seem to eradicate the weathering. Do it again, dull coat it again, repeat and the weathering will stick out. One simple trick is to dull coat anything plastic. All buildings should be painted, even if you don't change the color. Paint trucks - flat black, dirty black, oily black, use GG's trick. The solid brown trucks I've seen in the past don't make it for me - but trucks are dirty. 1) Buy several books on weathering. 2) Read them cover to cover to learn the techniques. 3) Learn only the techniques, don't copy what they do. Use your eyes and photos for that. 4) Don't paint anything using straight "weathered black". Thank you for your tips. I've noted them as well.